Beatport #1 remixer, label boss, pop songwriter and one of few DJs who can still sell tens of thousands of compilations, not to mention smash a festival stage - in 2010, Bass Kleph seems to have done it all. His first Beatport #1 with his remix of Joan Reyes's Shakedown. His first appearance in the top 10 in the inthemix Australian DJ top 50. A club and radio pop smash with $pend My Money (feat Stellar MC), as well as a top 20 Beatport main-chart hit with his own track, Keyboard Cat. And dates across Spain, the UK, the US and Canada, Russia, China, headline slots at the Good Vibrations Festival in Australia, remixes of huge acts like Green Velvet and Sarah McLeod, and the continued success of his own label and its crew of producers - Vacation Records, and its new sister label Exit Row. But the success hasn't come from nowhere. To understand Stu Tyson, as he's known offstage, you've got to know a little about his history. First, he's been practicing his craft forever. Most kids are still at school at age 15, but as a teenager Bass Kleph was touring Australia and New Zealand as the drummer of a hugely successful three-piece rock act, Loki. Playing live in grubby rock venues, he says, gave him his earliest understandings that there's a dynamic to making crowds dance. A catchy rhythm won't catch without the hypnotism of an irresistable hook - but then even the most nagging hook won't shuffle the feet until it's bent out of shape by the thunder of a serious rhythm section. Really, the rock world had no chance of holding on to him. As Bass Kleph says, "I remember when Loki got its first album back from mastering. I'd been listening to Squarepusher and The Prodigy. Everyone else was stoked with the way the album sounded - but I thought 'why are the drums so quiet? Why is it all about the guitar?'" And why, he thought, couldn't Loki do more with that cool little bit of equipment he'd found in the back of the studio - a drum machine? Loki imploded eventually, the inevitable result of the music industry trying to screw all it could out of the band's three teenage members. Bass Kleph left, determined that he wouldn't taken in by the empty promises of the industry again - but also that next time round he wanted to do it differently. A more electronic sound, focused on his new obsession, DJing. That was 15 years ago. Bass Kleph been DJIng just about weekly now for 10 years - and the DJ booth is still one of his favourite places to be. He started in breaks, but soon pushed aside that genre's limitations to add new, more subtle shades to his dancefloor palette - hypnotic techy grooves, jackin' electro, and the curveballs that distinguish a real musician from the average gigging DJ. Sure, Bass Kleph's earliest gigs took advantage of his unique understanding of how to bring a crowd to its peak as part of a live band. But it's the hundreds and hundreds of gigs since, from tiny clubs to huge festival stages, that taught him the craft of DJing, developing a style that now can push the most beard-stroking underground crowd into a hand-waving frenzy, or lock a mainstream crowd into a dark, heads-down and wordless groove. 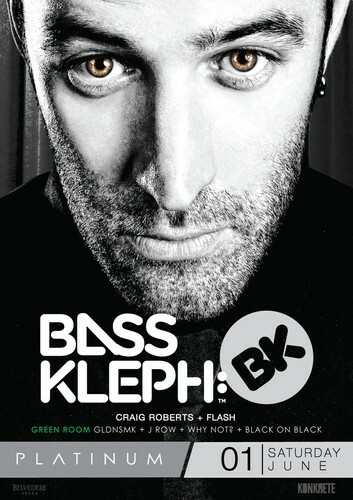 And of course, there's no-one like Bass Kleph for proving the cliche that the best DJs get the girls on the dancefloor. But then it's not just about DJing. In 2007, Bass Kleph founded Vacation Records, followed in 2009 by the more stripped-back sound of Exit Row. Releasing and collaborating with international talent like Wolfgang Gartner, Micky Slim, Mowgli, and big locals like Hook n Sling, Stupid Fresh, Twocker, Tommy Trash, fRew, Dopamine, Bass Kleph's labels and his music have helped popularise a wonderfully Australian view of the world. From the label's lazy-days artwork to track titles like Keyboard Cat, Bump Uglies, and But Enough About Me, it's irreverent, but it's also humble and self-depreciating - so today the label's fans stretch from the stadium players like John Aquaviva, Crookers, Rene Amesz, Mark Knight, and Kissy Sell Out to the brightest lights of the techno underground like Alex Kenji, Popof, and Fergie.